We will deal firstly with the parks. 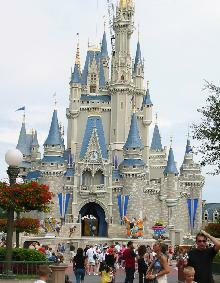 Love them or hate them, most people heading for Florida will visit the Theme Parks. The most famous, and popular, of these is, of course, Walt Disney World, and so we will start with the four main parks in that resort. The best tip we can give to anyone heading for the parks is to get there early (about 30 minutes before the official opening time). Many parks open earlier than advertised, and you should try to go to the most popular rides or attractions first, before relaxing to enjoy the atmosphere. This way, you will (hopefully) beat the queues and see everything in the one day. We have tried to list the most popular rides and shows in each park. To many people, The Magic Kingdom is WDW. It is the original park, and the biggest. It is also the busiest. You approach the park by monorail or riverboat from the Transportation Centre, and see the beginning of the Disney mountain range. The range consists of Space Mountain, Splash Mountain and Big Thunder Mountain. As you enter through the main gate, you arrive on Main Street USA with its rows of shops on both sides of the street. At the top of the street stands Cinderella's Castle - which is neither a ride nor a show, but simply a striking centre piece of the park - and this is the focus of the night-time fireworks and laser show. 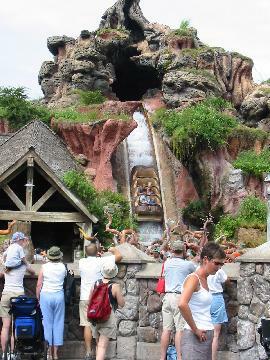 Visit Frontierland to ride Splash Mountain and Big Thunder Mountain Railroad if you dare. Both are enjoyable rides, but not too fast or “white knuckle”. Beware – you will get wet on Splash Mountain.<?xml:namespace prefix = o ns = "urn:schemas-microsoft-com:office:office" />The other fast ride in this park is Space Mountain – a roller coaster in the dark. Most coasters give a better thrill if you ride at the front, but we found it better to be in the middle of the car here as you can see the track ahead if you are at the front. The thrill is the darkness, but this is not total blackout and so the effect is lost if you are at the front. Space Mountain is in Tomorrowland, alongside Buzz Lightyear’s Space Ranger Spin – a must for the kids. Our tip for enjoying this park is to head for Frontierland first, where both Splash Mountain and Big Thunder Mountain Railroad are situated. Do both rides as early in the day as you can (you will get wet on Splash Mountain) and then head over to Tomorrowland for Space Mountain. After these, you can get a "Fast Pass" for the Pooh ride, and then start to explore the rest of the park. Not a great place for young kids, but an interesting and varied day out. 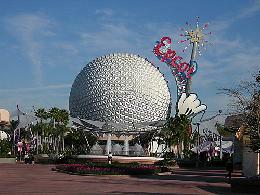 Futureworld opens at 9:00, and you must ride Spaceship Earth – the feature attraction of the park. Other impressive events are Honey, I Shrunk the Audience, Food Rocks and Cranium Command. We found the newer rides – Test Track and Mission Space - to be among the best in any park. World showcase opens at 11:00, and borders the lake. Visit many countries and sample the food and culture (and shops) from them all. There are good rides at Norway and Mexico, and every country features realistic displays from home, including a real British pub with a fish and chip shop. Canada has the most exquisite steakhouse, and China has a good selection of oriental food, but the best food is in France, with some delicious pastries. The night ends at 9:00pm with a magnificent fireworks and laser show - the second best in Florida behind MGM Studios (in our opinion). Also worth seeing are the Muppets 3-D show, and the Backlot Tour (including a trip to Catastrophe Canyon). We suggest heading for the Tower of Terror first, and then going next door to the Rock 'n' Roller Coaster (be warned this goes from 0 - 60 mph in less than 3 seconds!!!) before planning the rest of your day around the times of the shows. At night, there is the Fantasmic show. If you do nothing else in Florida, you must see this show. It is worth the ticket cost alone. It combines lasers, lights, fireworks and music with clips of classic Disney films projected onto walls of water. The newest park is a direct challenge to Tampa’s Busch Gardens. It is still developing, but the rides are good. Kali River Rapids was not as good as it could have been, but Dinosaur is superb. The safari trip is good, if a little spoiled by the inane commentary, but without doubt the highlight of the park was The Lion King Show. If you do nothing else in this park, queue early to see this spectacular show. 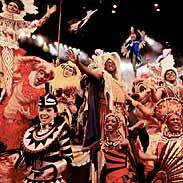 It lasts for about 30 minutes, but it is a spectacular show filled with colour, music and acrobatics. The tree of life is impressive, but the show inside the tree – It’s Tough to be a Bug – is not for the faint-hearted. The only advice we would give is that you should remain seated until the show is completely finished! Newer rides in Dinoland are TriceraTop Spin and Primeval Whirl. The former is a good kids ride, while the latter is an enjoyable but not too violent ride for older kids and adults. We suggest you head for Dinosaur first, before heading for the River Rapids (again, you will get wet) and then planning your day around the times of the shows. 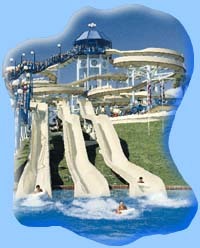 Disney has 2 water parks – Typhoon Lagoon and Blizzard Beach – but there are others in the area – most notably Wet ‘n’ Wild. We liked Wet 'n' Wild, but would also recommend Typhoon Lagoon as probably the better of the Disney offerings. Wet 'n' Wild is on International Drive, and suffers from being so close to the main road. You cannot escape the traffic noise and staring pedestrians while in the park, but it makes up for this by having the best rides of all the water parks in the area. Typhoon Lagoon is more family-orientated, while Blizzard Beach has the highest water slide in USA (it goes straight down, and down, and down). Hold on to your swimming costume if you dare to take this challenge! 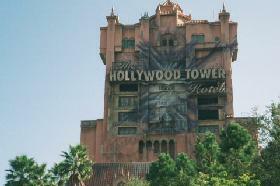 Similar in theme to Disney’s MGM, it is probably not quite as effective, but is still a good day out. It concentrates more on rides than shows, although Beetlejuice’s Graveyard Revue and the Blues Brothers live street show are worth seeing. Top rides are Men in Black and Kongfrontation, while ET is a must for the kids. Terminator is a good experience too, while Twister is OK but a bit frightening for the youngsters. We suggest you head first for Men in Black and again plan your day around the times of the shows. Universal's new park is a ride-dominated area with some of the best rides in the area. 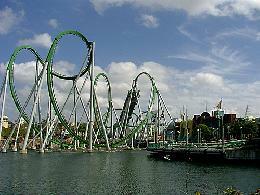 The Incredible Hulk and Duelling Dragons are great coasters, with Hulk probably the scariest in the state. Dr. Doom's Fearfall is a tame imitation of Disney's Tower of Terror, but you do get a good view of the park from the top. Park designers insatiable desire to soak guests is matched only by park-goers insatiable desire to be soaked, and this park has Jurassic Park (wet), Dudley Do-Right's Ripsaw Falls (wetter) and Popeye and Bluto's Bilge-Rat Barges (totally drenched) to satisfy your needs. The kids will like Seuss Landing, with rides like Cat-in-the-hat, while Spiderman is a more intense experience but still worth a visit. We suggest going to Hulk, Dr Doom and Spiderman first (all are close to each other), before planning the rest of your day around an "express" ticket for Duelling Dragons. For a complete change of pace, go to Seaworld – the conservation zone that thinks it is a theme park. It actually works well, especially with the addition of Journey to Atlantis (you will get wet again) and the fearsome Kraken. We rode all the coasters in all the parks and Kraken was the best (or worst, depending on your point of view). The beauty of Seaworld is not the rides; it is the up-close encounters with the seals, sea lions, dolphins, whales, stingrays, manatee, penguins and sharks (behind a frighteningly thin glass wall in “Terrors of the Deep”). There are some good shows – particularly Shamu Rocks America and Clyde & Seamore – but the tranquility in the park is a refreshing change from the hustle and bustle of Disney. We suggest you go to Kraken first, and then neighbouring Journey to Atlantis, before enjoying the tranquil setting and planning your day around the show times. This was formerly known as Belz. Situated at the north end of International Drive, it has almost 200 shops ranging from kitchen and electrical equipment to Disney toys to sports gear to jewellery to CD’s. Sports fans must visit the Nike shop, while Calvin Klein, Guess, Levi and Gap also boast great bargains. It may take the best part of a day to shop here. It had lost a little of the sparkle of previous years, but the change of name has renewed the appeal of this mecca for bargain hunters. Situated across from Prime, this is a new development with many new shops. It does not boast the same bargains as Prime or Premium, but is still worth a visit for the serious shopper. A large mall with over 200 stores, most of the large department stores can be found within this attractive facility. The food court is good, and the atmosphere is more relaxed than at Prime. There are a few bargains to be found if you really look, but this is more for the serious shopper. This is a relatively new development at the southern end of International Drive. It is aimed at the same market as Prime, and has overtaken it as THE place to bargain hunt. It has some good shops, and a great store that makes and sells fudge and toffee, and is a good place to spend a spare half day. Take our advice and don’t spoil your days at the Disney parks by buying too many souvenirs. Instead, spend some time at the shops at Downtown Disney. Why carry your purchases around all day (and risk losing them on one of the rides) when you can buy exactly the same things at this free-to-enter complex? We have yet to see anything for sale in the parks that cannot be bought at Downtown, with the exception of the ride souvenirs. We therefore recommend a day at Downtown Disney to pick up your holiday gifts. This is for serious shoppers only. It has some beautiful boutiques and designer shops, with names like Tiffany prominent. For us mere mortals, it is nice to window shop! <?xml:namespace prefix = o ns = "urn:schemas-microsoft-com:office:office" />A further one-hour drive in the opposite (westerly) direction is Busch Gardens. This is similar to Animal Kingdom, and is run by the same company as Seaworld, but it differs from both. It has a handful of great rides (of which Montu is probably the best) along with the mandatory soaking on Tidal Wave (beware – this was the wettest we found) and a good safari tour. It is usually quiet, and should not take a full day to visit, but it is worth the drive. We suggest you do as many of the roller coasters as early as possible, and then tour the animal shows and displays. As well as the shopping, Downtown has nightclubs, jazz and blues bars, a saloon and a comedy club and a cinema. 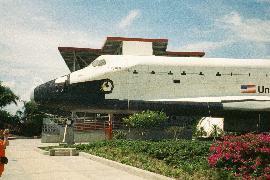 There is also a Planet Hollywood restaurant. We loved the House of Blues, but it is your taste that counts. No matter what your taste is, there is something here for you. A new addition is Cirque du Soleil. This contains dance, circus, music, and comedy in a 90-minute show that is worth seeing. Try the Crab House on the large white paddle steamer located on the lake - it has the best seafood in town. There are thousands of eating-places in the area – from Chinese to Steaks. When living in the villa you must try an American Buffet Breakfast – we found the one at Ponderosa to be the best. These “all you can eat” meals can cost as little as $2.99! As well as the mandatory McDonalds, Wendy’s, KFC and Taco Bell, there is a plethora of quality steak houses. We particularly liked Outback and Cattleman’s, which are both on 192. Also worth a visit is Sweet Tomato on International Drive – a vegetarian delight which has a very cheap buffet service and some of the best soup you will ever taste. Take the kids to Chuck E Cheese’s on International Drive – not so much a restaurant as an eating experience for pizza-loving children. Whatever your taste in food, you will find everything on 192. For a buffet dinner, the Golden Corral chain offers the best value, while a visit to Sonics on International Drive is a trip back to the fifties with waitresses bringing your food to your car while on rollerskates.